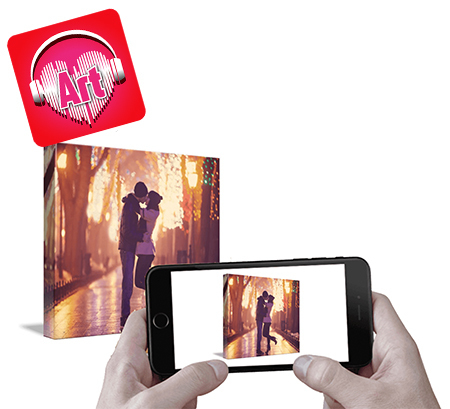 Canvas Photo Art with Soundwave Media™ | Photo Art You Can Watch! | Soundwave Art™ - Turn your voice or sound into art! Turn your favorite photo into canvas art! Upload your photo, then upload a video related to your photo. With our Soundwave Media™ technology you will be able to scan your canvas using our mobile app and watch your video! We use augmented reality to overlay your video on top of your artwork, merging the digital and physical world. See how it works below. Expect quality and longevity with our archival inks and heavyweight canvas. A satin coating provides UV protection. Your Gallery Wrap arrives ready to hang. Available in: USA, Canada & Europe. Comes ready to hang.